TSpanning the picturesque and meandering Griboedov Canal in one of the most beautiful city parts in the vicinity of the Theater square and the world-famous Mariinsky (former Kirov) Theater, the pedestrian Lions Bridge with its elaborate railings, floor lamps and lanterns was completed in July 1826, according to the plan of St. Petersburg architects V.A. Khristianovich and G. Tretter. 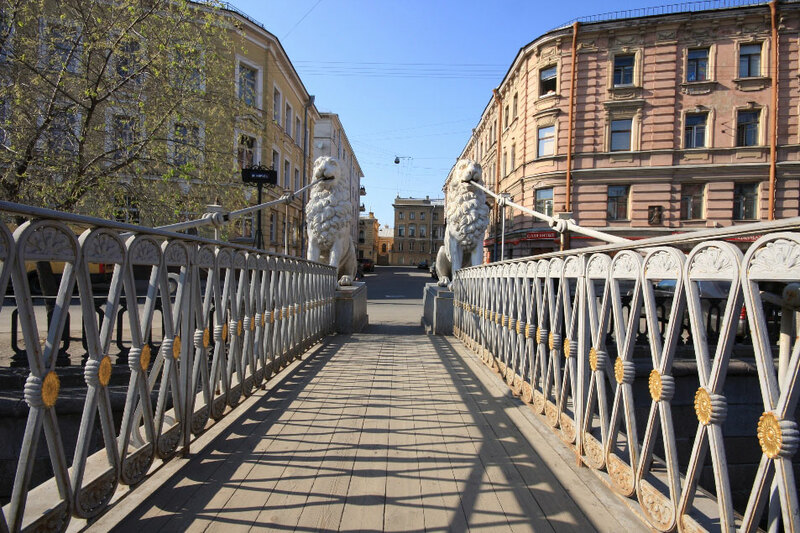 22,4 meters long and 2,2 meters wide, the Lions Bridge has become one of the city landmarks and got its name due to four majestic cast-iron lions (sculptured by Peter Sokolov) that appear to ingeniously and mysteriously guard the passageway onto the charming chain footbridge. The sketches of these exquisite sculptures were developed by architect Tretter - one of the foremost advocates for building the first chain bridges in the city, whose intention was not only to adorn the bridge by these gorgeous statues but also to hide the shining gold and gray chains vital to the bridge's suspension inside the lions. Although the intricate support system of the Lions Bridge was an innovation in that days, it's not the only claim to fame - the elaborate railings (veritable net of continuous crisscrossing rectangular bars, which are adorned by various glimmering bronze rosettes) are of noteworthy design as well – since the Lions Bridge was constructed elaborate railing style became particularly popular in St. Petersburg and was used as a model for new bridges.